THE PLANETARY CENTER DIFFERENTIAL IN THE WRX STI SPLITS ENGINE TORQUE IN VARIABLE RATIOS BETWEEN THE FRONT AND REAR WHEELS. IT ALSO GIVES THE DRIVER A CHOICE – LEAVE RATIO CHOICE TO COMPUTERS OR SET IT YOURSELF. All-wheel drive performance cars are rare enough. But the WRX STI is even more unique because the driver can choose the value of the torque split between the front and rear wheels! 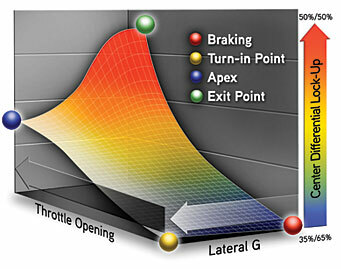 Whether the driver makes adjustments to torque distribution in the manual mode via the console-mounted control wheel or entrusts distribution decisions to the DCCD control module through the automatic mode, the ratio of front/rear torque distribution can vary from 35 percent front/65 percent rear to 50 percent front/50 percent rear. In automatic mode, DCCD varies torque according to input indicating acceleration, deceleration, cornering force and wheel slippage. In manual mode, the driver selects from six stages of center-differential lock-up. The more lock-up, the greater the torque directed to the front wheels – up to the 50 percent front/50 percent rear ratio. 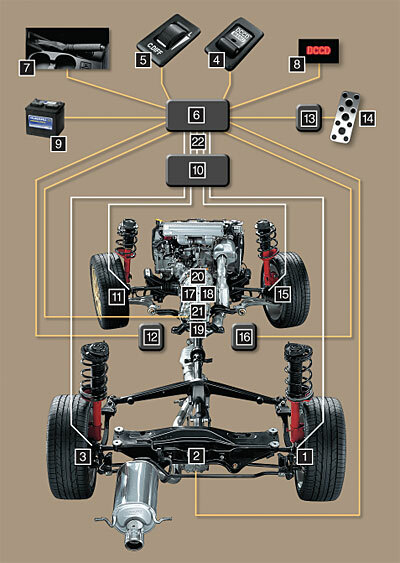 Mechanical limited-slip front and rear differentials enhance the system’s effectiveness. The intent of the adjustable torque split is to improve handling and give the driver an increased sense of performance driving. DCCD accomplishes this through the integrated functions of numerous components. Along with the mechanical components in the center differential, DCCD utilizes control units, sensors and switches from around the STi. Among them are the mode switch and control wheel on the console, throttle position sensor, parking brake switch, wheel speed sensors, ABS control unit, lateral G sensor with yaw rate sensor, rear differential oil temperature switch, brake light switch and instrument panel lights. At the heart of it all, electronic control of a multi-plate transfer clutch in a center differential planetary gear set determines the torque split between the front and rear drive wheels. The split ranges from completely “free” (35/65 ratio) to “locked” (50/50 ratio). Clutch control is by an electromagnet. To lock the differentials, the clutch plates function to restrict torque to the rear axle, distributing more torque to the front. Lowering the torque restrictions frees up the ratio for more torque to the rear. Fail-safe contingencies are built into the system. Should the electric coils that operate the clutch within the differential fail, POWER to operate the clutch turns off and the driver is alerted by a warning light. Sensor failure anywhere within the system fixes the last reading of that sensor as a default, and the driver is alerted that a fault has occurred. AUTOMATIC MODE. Unless the STi is used for all-out off-road rallying and/or the driver is competition-competent, automatic mode is probably the best choice. The system utilizes sensor inputs that indicate driving style and changing road conditions. In automatic mode, DCCD reacts quicker with changes in front-to-rear torque ratio than most drivers are capable. Under braking as the vehicle approaches a turn, the DCCD system reduces the restrictive force of the center differential toward a free state. Through a turn, between the turn-in point and the clipping point , the system receives input from the throttle as it opens and from the lateral G sensor. The center differential’s restriction torque gradually increases to improve cornering ability. Between the clipping point and the exit from the corner , input from the lateral G sensor decreases. The system increases the restricting force of the center differential toward the locked state to help maintain traction. MANUAL MODE. Drivers who want or need to do things for themselves have six stages from which to select via the control wheel after hitting the DCCD manual switch. Both controls are on the console. 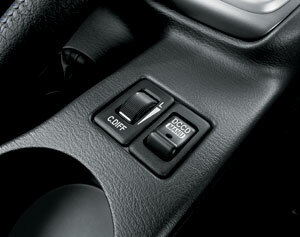 Automatic or manual mode, DCCD adds up to one of the most significant and enjoyable technologies in the auto industry. It enhances traction and control, which is much appreciated in a 300-horsepower performance car. Bring on the snow! Кстати мне тут написали... мол DCCD не перераспределяет крутящий момент между осями, а управляет степенью блокировки центрального диффа. Или это вопрос терминологии ? :) Кто че думает ? Вот я тоже такое слышал, но помнишь, на твоей машине зимой по острову ездил и как раз баловались ею, так поведение машины при разной степени блоки разные, поэтому думаю, что это вопростерминологии, на практике чувствуется, как машина приобретает выраженную "заднеприводность"
Игорь ты продавать передумал чтоли машину? Как отключить АБС на импрезе 2003г, с DCCD. Текущее время: 09:43. 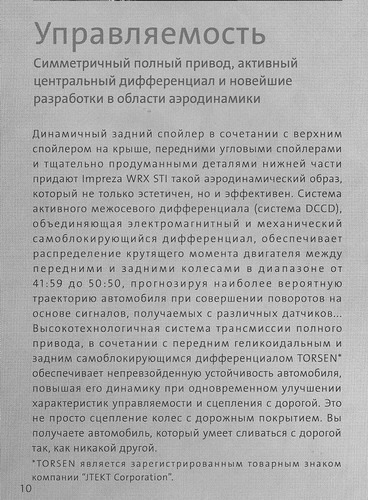 Часовой пояс GMT +7.